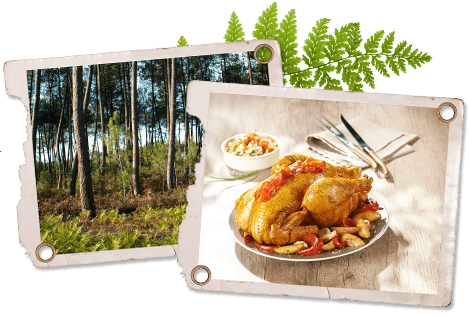 With these 3 main principles at heart, we fight both for French gastronomy and for the preservation of the environment, traditions that have guaranteed the original quality, authentic and unique, for generations and generations. To perpetuate these values, we are continually committed and proud to accept our responsibilities, now and in the future, for the animals we raise, for the people who eat them, for the area and for the planet, for consumers we want to treat and the professionals we want to serve. 1. Quality Guaranteed to the highest standards with the Label Rouge qualification and respect for natural production guaranteed by the Organic certification. 2. Using the original extensive production method : no noise or olfactory pollution, respectful of animals and the surrounding environment. 3. Favouring a GMO free diet composed of 80% corn produced locally. 4. Encouraging rearing methods that prioritise animal welfare from beginning to end respecting the lengthy development of this slow growing traditional breed. 5. Reducing the impact of our slaughterhouse on the environment through the reduction in use and the treatment of water, waste management, by-product recycling and energy efficiency measures. 6. Participating in sustainable development by also prioritising the health and well-being of employees in the company. 7. Creating employment and preserving the rural way of life, bringing life to the small farms of the area. 8. Creating added value for the sector and its businesses, with regard to butchers, delicatessens and caterers, by sponsoring, for example, the Regional and National Best Apprentice in France competition. The Label Rouge, a safe bet in terms of quality ! 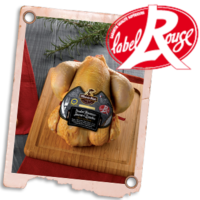 In 1965, the Corn-fed Landes Chicken was the first chicken in France to obtain the now famous “LABEL ROUGE”. 50 years later, FERMIERS LANDAIS has kept its lead and reaches such a high level of quality that we can speak of “Label within the Label”. 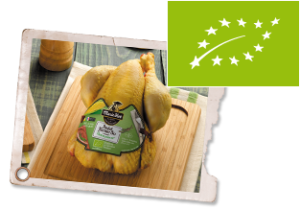 Organic chicken the Marie Hot way, more for taste and quality !